From Austin, to Houston, to Dallas and more, Texas is home to a collection of skate parks highly-rated by its guests. With beautiful weather a good portion of the year, Texas is an ideal place to get outside and get on that board. So if you’re a skater and find yourself in Texas, we have your back. Here are the 10 best skate parks in the Lone Star State. This is an “All Wheel” skate park in the Woodlands, Texas. The park consists of mainly a large bowl up to nine feet in depth and several other elements. This park is heavily supervised and will shut down for two hours at a time if a lot of the skaters are not wearing helmets. Be safe! Wear protective gear! A relaxed skate park with 8,677 square-feet of concrete to get your skate on can be found in Canadian, Texas. The park itself is designed for flow with base ramps, ledges, two horseshoe shaped bowls, and hubba ledges. You can totally spend your whole day here. In Houston, you’ll find this sweet skate park. It’s a pretty neat flat skate park with half and quarter pipes, pyramid and boxes & ledges to practice your best moves. Carolina Skatepark in El Paso underwent a huge makeover to become a stunning 12,600-square-foot park. It has a huge bowl up to six and nine feet in depth. In the shallows, two sets of stairs, ledges, a China bank, and a quarter pipe make up this improved skate park. Being the center of the N.O. 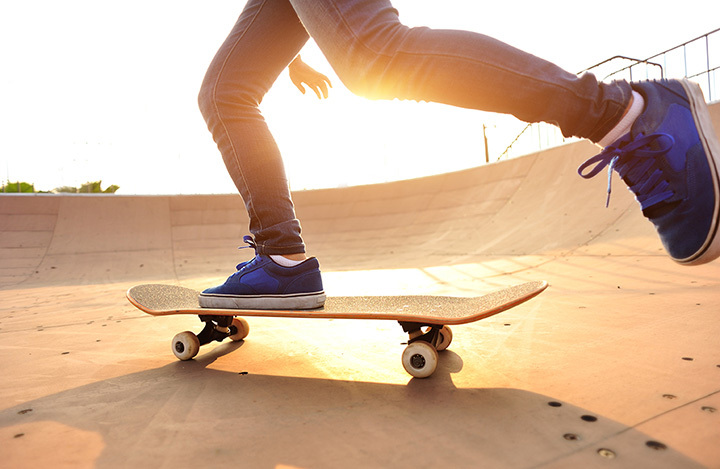 Simmons Public Recreation facility, Ingleside Skate Park is the place to be. Seriously, it’s been described as the best skate park in Texas by pro skaters. With 15,000 square-feet of bowls, also try out the hubba ledges, grind boxes and much more, this skate park is a favorite of many skaters but especially the seasoned ones. One of the coolest skate parks in Texas is the Lee and Joe Jamail Skatepark in Houston. This place takes the cake with 30,000 square-feet of pure fun in downtown Houston. There’s variety, available to levels of all caliber, urban art, and really just the perfect atmosphere to live the skater life. Lakeland Hills Skatepark in Dallas was built in 2007. There are metal ramps, obstacles, half and quarter pipes, ledges, and even a beginner skate area. Relax with your friends at their picnic table set up to sit down and eat/drink together. Lakeway is definitely known for its scenery, so you won’t be disappointed when you skate this 9,000-square-foot park. This is a street-style park with a big bowl, handrail, stairs, metal coping. There is a curfew and kept watch by camera. The Edge at Allen Station Skate Park is almost 38,000 square-feet and holds a fun area with stairs, ledges, boxes, and banks. Lucky for skaters there are shaded areas, a picnic table, and lights for when it gets dark out. William Sam Memorial Skatepark in Midland is a competitive area mainly because bikers are not supposed to be there but they fight for the space. It’s a super hot spot to be during the Summers because of their real jam sessions! What do you think? Are you a skater and have some input as far as your favorite skate parks? Let us know where your favorite spot is!